How many times have you applied a trim protectant or tire shine, only to have the product end up on unwanted surfaces or even worse, your hands? Enough was enough, so I developed the Dual Action Trim & Tire Applicator Sponge. This handy applicator was specifically created for the unique design characteristics of modern vehicles – i.e. : low profile tires and acres of plastic trim. Everything about the Dual Action Trim & Tire Applicator Sponge is custom, including the carefully chosen foam for applying even, uniform coats of trim and tire shines. 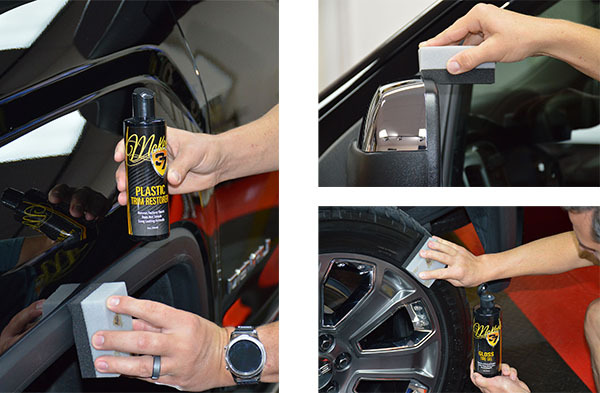 You’ll love the fact that these applicator sponges make detailing trim and tires easier than ever – I guarantee it. Long gone are 15, 16, and 17 inch wheels. The 18, 19, and 20 inch wheels (and their corresponding lower profile tires) that used to be exclusive to sports cars are now available on virtually every new vehicle, including inexpensive sub-compacts! Simply put, the bigger the wheel, the smaller the tire’s sidewall. This presents an issue for conventional tire shine applicator sponges, because you end up with more product on your wheel (or hands!) than the actual tire itself. That’s not the case with the Dual Action Trim & Tire Applicator Sponge from McKee’s 37! The Dual Action Trim & Tire Applicator Sponges are built to last, even after repeated use and multiple cleanings. Neither foam will shred over time, even when used on tires with raised letters. What's more, you can use the Dual Action Trim & Tire Applicator Sponge to apply interior protectants and leather conditioners too! Are you frustrated with round applicator sponges that end up applying trim restorers and protectants on surrounding body panels? The sharp, 90 degree edges of the Dual Action Trim & Tire Applicator Sponges provides precise application every time! Deserves 10 stars! 5 These applicators are what the detailing world has needed for years! Thankfully Mckees37 was innovative enough to take a chance on manufacturing them for us. The applicator allows you to dress trim and tires with 100% accuracy regarding even coats and keeping the dressing off of paint or wheels. Another upside is how resilient they are! A lot of applicators will fall apart fairly quickly especially with all-terrain tire lugs, these do not!